Donatio non praesumitur: A gift is not presumed. One pet theme of many a Tamil movies is ‘vaikkal varappu thagararu’ ~ conflict over land, more importantly that piece that would give access to water for irrigation from the canal. A group or a powerful man would prevent access keeping things under control exhibiting naked power, money and strength ! – conflicts over land, killings, reprisals have all dominated history of mankind. A moot hill or mons placiti is a hill or mound historically used as an assembly or meeting place, as a moot hall is a meeting or assembly building, also traditionally to decide local issues. In early medieval Britain, such hills were used for "moots", meetings of local people to settle local business. Among other things, proclamations might be read; decisions might be taken; court cases might be settled at a moot. Although some moot hills were naturally occurring features or had been created long before as burial mounds, others were purpose-built. ~ sounds much akin to our Nattamai theerpu in pathinettu patti !! Sasine in Scots law is the delivery of feudal property, typically land. Feudal property means immovable property, and includes everything that naturally goes with the property. For land, that would include such things as buildings, trees, and underground minerals. A superior (e.g., a heritor) might authorise his agent or factor to give possession of his property to someone else through a document known as a "precept of sasine". Over time, sasine came to be used in common speech as a reference to the deed or document recording the transfer, rather than to the transfer itself. Hence phrases such as "to give sasines", "to deliver sasines", "to receive sasines", "to take sasines". In a shocking story from Adilabad district in Telangana, a man claimed that he owns one fourth of a village, and threatened to evict the residents who live on this land. Boyaru Vittal, a 38-year-old from Adilabad town asked 36 families to vacate the homes they’ve been living in for close to five decades, and has accused them of encroaching his great grandfather’s land. In Feb this year, the 36 families of Kanta – which is approximately 300 km from Hyderabad – were shocked when they received legal notices from Vittal. Not just notices, they also got summons from the Regional Divisional Officer (RDO) over the issue on Mar 3. While land disputes became common everywhere after the real estate boom, locals of Kovilkannampoor in Kizhvelur taluk have no such worries because none of its residents owns land, wrote Indian Express. The 1,250 residents of the village are by no means poor; they even have large houses. But the land they live and cultivate on is not in their names. Instead, it belongs to the Nadukurinathar Shiva temple, built in the Chola era. Speaking to Express, G Jayaprakash, a Kovilkannampoor resident, said, “Because of the practice of land ownership in the names of private individuals, issues like land-grab arise. A third of disputes in rural areas is because of land, which we call vaaikkaal, varappu thagaraararu in Tamil (disputes over land and canal). 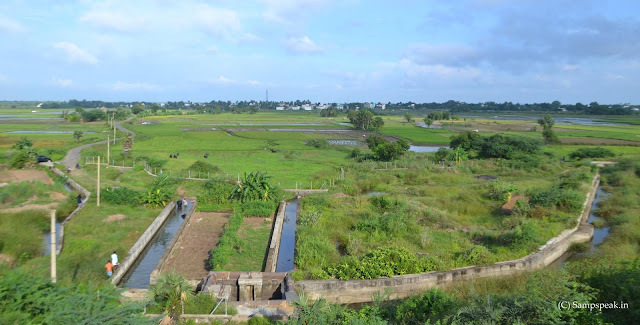 This means that when forming a furrow and canal, some can unknowingly occupy parts of others’ land in agricultural fields, leading to tension.” He added that all the residential and agricultural land, spanning around 300 acres in their village belonged to the Nadukurinathar temple. “It is clearly mapped and surveyed. As there are about 250 families in the village, including 30 Dalit households, everyone owns a house and cultivates on temple land without any disputes. While Dalits mostly work as farm labourers in the district, in our village, all Dalits are successful farmers. Except during the drought period, all farmers have been leading a happy life.” “If there are any doubts over land, we will call the village administrative officers and HR&CE officials so they can sort it out immediately. We do not fight over land and have not filed any civil cases as there has never been a problem here,” the Kovilkannampoor resident added. Not sure whether they are paying reasonable value for usage of the Temple land and whether they all continue to practise Hinduism. The late James Muirhead, the respondent's eldest son, in 1697 married the appellant an Englishwoman at London; and the parties in the present appeal severally allege, that deceit was used with respect to the fortunes of the husband and wife on that occasion. In Sept 1700, three years after the marriage, articles of agreement were entered into in the English form, whereby the husband covenanted to settle lands in Scotland of the annual value of 250 l. for his wife's jointure; or to leave her at his death 2000 l. personal estate, and 2000 l. more to the issue of the marriage. He afterwards brought his wife to Scotland, where they both for some time resided with the respondent. But misunderstandings arising in the family, the son brought an action before the Court of Session against the respondent his father for exhibition of a disposition of the lands of Bradisholm, which had been executed by the father in favour of the son, and of a sasine taken thereon; and for declaring the son's right to the estate in consequence of these titles. Soon after the commencement of this action James Muirhead the younger died, leaving issue of the said marriage a daughter, and the appellant his widow pregnant with a son, who died in a short while after his birth. About six months before the husband died, he executed a holograph deed in the appellant's favour, and thereby “surrogated, substituted, and appointed the appellant, and gave to her his full right to all and everything he had or could have had if living, as fully and amply in all manner of respects as if everything were there Set down at large;” and he appointed the appellant his sole executrix. After her husband's death, the appellant re-commenced the action of exhibition and declarator against the respondent, to compel him to produce and deliver uncancelled the respondent's marriage settlement, whereby (the appellant contended) her husband was to succeed his father in his estate. The respondent made objections to the title of the appellant to carry on the action, as founded on the deed executed by her deceased husband, which being a testament, if it could be supposed to extend to lands, the devise was void by the law of Scotland. The respondent further deposed that in 1684, the time of the Test, he was in prison for not complying with the temper of that time, and understood that the government was to press the Test on all heritors, and accordingly by an act of parliament in 1685, the same passed into a law:—“that he remained prisoner till 1686, and having taken the advice of lawyers how to preserve his fortune, upon their advice he granted a disposition in favour of his son, a child then 12 years old, both fee and liferent, but burdened with the payment of 60,000 l.
The appellant, after this deposition was made, protested against all the qualities contained in the same, in regard there were no qualities contained in the act which directed such examination to be made. She also petitioned the Court, that the respondent might be compelled to search for the disposition and sasine, and if found, to exhibit the same in such state, as they then were.—The respondent accordingly was re-examined, and deponed that after search he could not find the disposition and sasine. After advising these depositions, the Court, on the 26th of July 1706, “Found that the defender cancelled the disposition and seisin warrantably, and that the oath proved not, and assoilzied the defender from the exhibition, and declared him to be free therefrom.” It is a rule of the law of Scotland, that the mind and intention of the grantor at the time of making a deed are principally to be considered. The disposition in question was merely gratuitous, and for no antecedent onerous cause. After hearing counsel, the Court ordered and adjudged that the said petition and appeal be dismissed this House, and that the sentence or decree therein complained of be affirmed.